Woods used in these tippers are carefully selected for hardness, durability, density, and character. 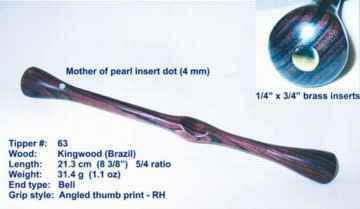 Since supply of some of these exotic woods is irregular, some wood types may temporarily be unavailable. Tipper lengths range from 6 & 1/2 to 9 & 1/2 inches (17 to 25 cm), with the most popular lengths in the 8 to 9 inch range. The length between the outstretched little finger and thumb is often used as a guide to the maximum length for an individual's hand, but opinions vary widely on this subject. Tipper weight is a major consideration for most players. 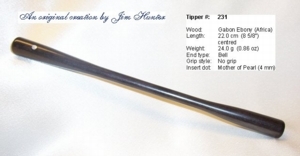 Our tippers range in weight from 22g to 50g, with the majority being in the range of 28 to 35g (1 to 1.25oz). Weight is primarily a function of the wood density and the size and shape of the tipper (i.e., total volume of the object), but adjustments can be made by the addition of brass weights in the ends (see also tipper speed, below). Tipper end-shapes are considered by many players to control the volume and type of sound. Our tipper ends come in rounded (ball), tear-drop, and bell shapes. The tipper-end area in contact with the drum varies widely between these shapes. 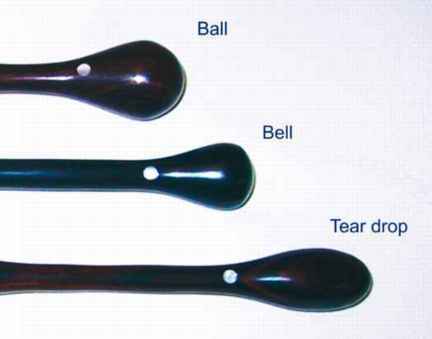 It is suggested that the sharper edge of the bell-shaped end ha the least area of contact and produces the harder (sharper) sound. Type of grip is a very personal choice for players, depending on hand size, method of holding, finger shapes, and strength of fingers and wrists. 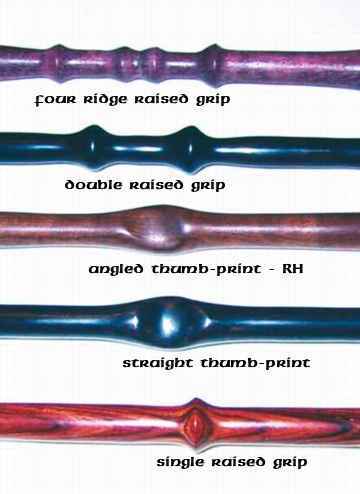 Our tipper grips include a single groove or depression, single or multiple raised bumps or ridges, and thumb-print grips with right-handed, left-handed, or straight-across variants. The most popular are the double raised bumps and thumb-print designs. Most of our tipper grip points maintain the traditional 5/4 length ratio between the ends. We also produce tippers with centered grips and can make tippers with other ratios on request. Tipper speed is a result of several factors, including wood density, shape, length, and weighting with inserts, not to mention characteristics of the drum head. As a rule of thumb, short overall length, combined with the larger mass at the ends, will usually produce a "higher speed" response. The rough wood stock is cut and mounted between centers on a lathe and shaped to a cylinder using a roughing gouge. Basic end-shapes and grip styles are marked on the wood as a guide. Shaping is done by hand with 3/8" and 1/4" gouges and a parting tool. Sanding is carried out by hand while the tipper is on the lathe. 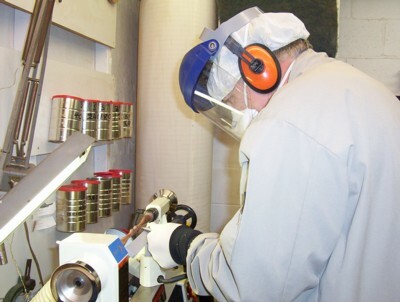 Sanding is done with the following grit sizes: 240, 400, 600, 800, 1000, 1200, 1500, 2000, 2500, and 3000. 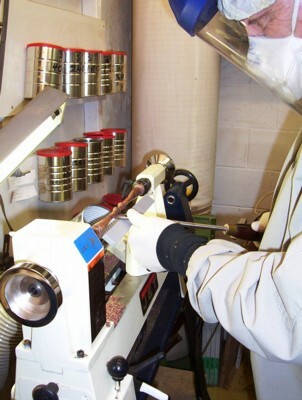 Decreasing the grit sizes (increasing the numbers) in small increments, although time-consuming, produces a finer finish. Sanding is temporarily halted after the 1000 grit application in order to inlay the "signature" mother-of-pearl 4mm dot. 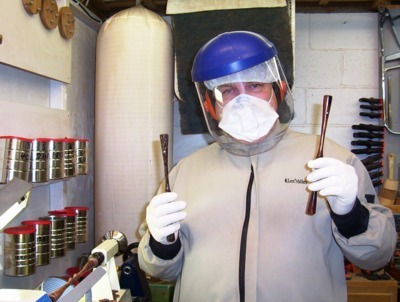 Upon reaching 3000 grit, the tipper is parted from the lathe. If artificial weighting is to be added, holes are then drilled and either 1/4" or 1/8" brass inserts are installed. In order not to alter the natural beauty of the wood, no chemical finishing product is added; the luster is entirely the result of sanding only. Be advised that some of the exotic woods have natural oils which may, in rare cases, cause some skin irritation. 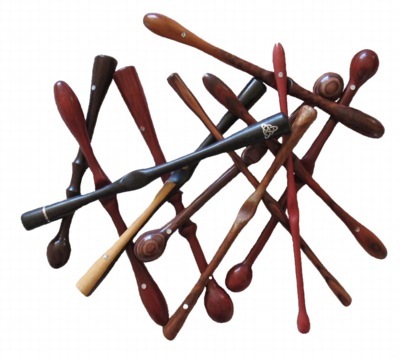 In the event that the luster of the wood dulls, buff with a soft cloth or polish with 2000+ grit sand paper. Me all suited up for turning. At sanding grits above about 1000 grit, the dust stays suspended in the air. I have two HEPA filter systems and one N-95 filter system operational throughout, including the separate run to finish the tipper ends. In addition, I wear a shower cap, gown, rubber gloves, face shield and an N-95 mask. After each session, the gown and cap are washed, the gloves and mask are discarded and I shower immediately. So far, the allergic reactions are minimal, usually around my eyes. Handling the finished product has not caused any allergic reaction for me, although I have heard from the turning community that some people have had skin irritation caused by touching Cocobolo; I have had no reports of any of my tippers causing any discomfort. 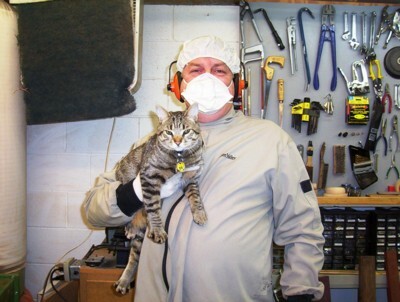 Me holding my assistant, Tigger, who has his own stool beside the lathe and watches carefully my every move. Here, my face is red and swollen; I was suffering from an allergic reaction to Pau Ferro at the time. I have subsequently given away my stock of that wood. We keep a record of our tippers, so all are photographed, numbered, weighed, and measured, and all have a descriptive log. Also, we are interested in knowing where they went, or on receiving any feedback on how they work (and suggestions for possible design improvements). We would be happy to hear from you! for Tommy Kochel, my webmaster. - to each his own! of size, shape, and balance. with Mr. Dennet's kind permission. We hope that your tipper will serve you well for many years. I am also the keyboard player for the Ottawa Fiddle Ensemble. We have just released a full CD which is available for purchase. Click on the band's name or the below photo to go to that site. Web page created and maintained by Tommy Kochel, December, 2004.